Jonas Stawski takes you, step by step, through a sample project that demonstrates how to create an application that can get GeoSpatial coordinate data for addresses within a SQL Server database, and then use that data to locate those addresses on a Bing Map on a website as pushpins, either grouped or ungrouped: And there is full source-code too, in the speech-bubble. Almost all applications rely on data one way or another, and most of those applications contain some sort of geographical or spatial data. If you think about the current application you are working on right now, I am sure that you can find some sort of spatial data. It could be an address, or perhaps the location of materials within a warehouse. With the spatial data types that were introduced with Microsoft SQL Server 2008, and the Bing Maps for Enterprise (Virtual Earth API), you have a new way to represent your data visually. This article shows you how to get started. Spatial data is represented through points, lines, and areas on a surface, using elements such as coordinates, triangles, rectangles, and polygons. In our day-to-day work, we use these elements to represent locations on the earth, but the use of spatial data is not limited to geographical representations. We can also use them to represent locations on a grid, a warehouse, or a simple rectangle. SQL Server 2008 has two new built-in Data types, the geometry and geography spatial data types. These are implemented as Common Language Runtime (CLR) types, the CLR being introduced in SQL Server 2005. The main difference between these two types is that the geography data type is used for geodetic spatial data and the geometry data type for planar spatial data. Your company has just upgraded from SQL Server 2005 to 2008. You are in charge of a new project that will visualize all the geospatial data of your database and provide tools to make better business decisions. In order to render the Bing maps, you must first transform your data so as to use the spatial data type. Before SQL Server 2008, the only possible way to include spatial data was to have one column for the latitude and another for the longitude, which combined results in a point. 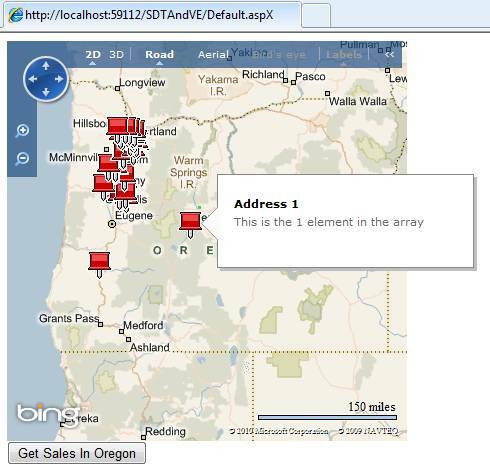 With SQL Server 2008 all we have to do is add a column with a geography (or geometry) data type to our table and then, just once, geocode the data into coordinates. Once you have the geography data type, there are built-in functions that provides data such as the length of a line, area of a square, surface of a circle, or simply the latitude and longitude of a point. In our case, we need to transform our addresses into coordinates and then save them as points in the database. There are many free and paid services for geocoding, and most of the free ones limit you on the numbers of request you can make on a given period of time. I will use the staging service of the Bing Maps Web Service. The accompanying project contains a SQL Server Express database with a customer table and some records with addresses. First, we will geocode the data. I will do so by creating a Console Application that communicates with the Bing Maps Web Service. You need to get a developer account before doing this. You can get more information on the following url: http://msdn.microsoft.com/en-us/library/cc966926.aspx. After you sign up, you will receive instructions on how to add a reference to the Bing Map service and a web reference to the Token Service. Figure 3 shows how your Visual Studio project should look like after all the steps are finished. We will use a console app that will perform a one-time conversion. We need to get all the records that need geocoding by calling the GetCustomersToGeocode() function. This returns a List<Customer>. Customer which is a custom entity that will hold the customer information from our database. Figure 4 displays the class definition of the Customer entity. Once we have the list of customers to geocode, we need to run the actual geocoding: This is done by calling the Geocode function and passing in the list of customers to geocode. We will take advantage of the Bing Maps Service to pass in an address and get the latitude and longitude back. 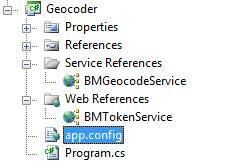 Figure 5 shows the code needed to call the Geocode function of the Bing Maps Service. We initially prepare the request by setting our own token, the address to geocode, and a filter of ‘high confidence’ in order to get only precise results. We then send the request and wait for the response, which can return zero or more results. If we do have more than one result we are only interested in the first one so we populate our LocationResult object with the latitude, longitude, and the formatted address so we can return it to the caller function. Note that the code above uses the BMTokenService web service to retrieve a token using our Bing Maps username and password. The code is displayed on Figure 6. Figure 6: Code for getting a token. Once we have successfully retrieved the latitude and longitude from the service we then have to save the Point into the database. We do this by means of a simple SQL Update using the SQL Server STGeomFromText static method, which takes a string with the type of geography object you want to create and a Spatial Reference ID (SRID). Figure 7 shows the query for updating the table. The string needs to be formatted in a Well-Known Text (WKT) representation from the Open Geospatial Consortium (OGC). In our case we use “POINT(Longitude Latitude),” but you can use others such as LINESTRING and POLYGON. 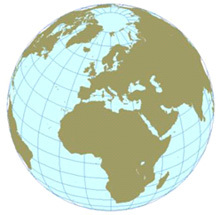 The SRID is the type of Spatial Reference System this specific Geography object is using. Why do we need this? Because SQL Server will not perform calculations on Spatial objects of different systems. One system might use centimetres, while another one might use inches. In our example we are using 4326, which is the World Geodetic System, a standard used in cartography, geodesy, and navigation. Running the console app updates the Customer table with the correct points. Figure 8: Results of the Customer table after the one-time conversion. Note the SpatialLocation column. 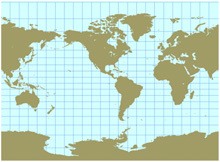 Figure 10: The map’s canvas, represented as a div. Figure 12: The end result of the map initialization. Figure 13: Server side code for retrieving all sales in Oregon. After everything has been brought down to the client, it is then the turn of the LoadPushPins() function to do it’s magic. We start by centering and zooming the map. In this case we are hard-coding the center and the zoom level to show the entire state of Oregon. Then we iterate through every lat and long element of the arrays and on every iteration we create a VEShape item which is represented as a pushpin. Each pushpin will hold a specific set of coordinates from our sales data, utilizing the lats and longs array. We then set a title and a description that will be displayed when the user’s mouse-pointer is over the pushpin and add it to the map using map.AddShape. Figure 15 shows the code and Figure 16 shows the end result. To turn clustering on we need to add a layer on top of the map, set the layer’s clustering configuration to VEClusteringType.Grid and add all the pushpins to the layer instead of the map. To turn clustering on or off is just a matter of changing the layer’s clustering configuration from Grid to None. Figure 18 shows how to do so and Figure 19 and 20 show the end result. 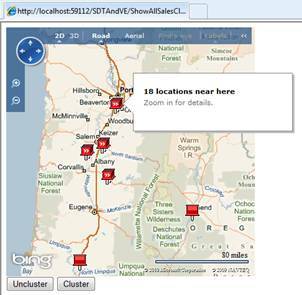 We saw how easy it is to create spatial data in SQL Server and display it on the map using Bing Maps. We now know how to integrate SQL Server and Bing Maps so as to visualize our geospatial data on the earth’s map, thereby making it easier for our business users to make decisions on their daily work. 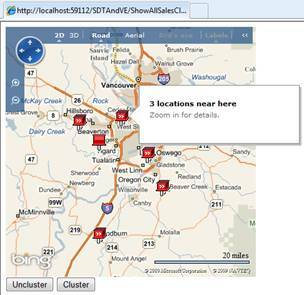 Stay tuned for part 2 of the article, which will show more examples on how to use the power of Bing Maps in conjunction with the power of the SQL Server spatial data types API. Please put out a Part II. I am a total amateur to development and your article is understandable, yet detailed enough to allow me to provide this service to my client. Nice article, I am new to mashups and this article came just in time for my project. Looking forward to the next installment. Thanks! I want to put bing maps on local server so that i can workoffline also . how should i approach and sow should i start. 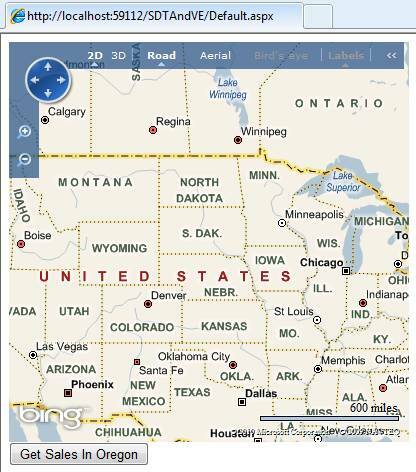 Bing map control makes use of a service provided by microsoft virtual earth. If you can write your own service to store & retrieve images understandable to bing control then it will work. Deep Earth control works offline as well. Thank you for a great detailed article. I am looking for a product or service that will just take my address data and put a lat/lon on it. I am looking for a batch service and an on-demand service. I have approximately 50 million addresses. We are not looking to create maps or analyze any demographic related data. We only want Lat and Lon’s. Do you have any reccomendations? Its a great article. Awesome. The article greatly helpful to know the scenario clearly. I want to know the database connection and the table structure to bind the data. Please send me the table structure for my reference. I found this very well written and informative. Going to try and set it up and play with it. Will be setting it up on a local machine with sql express. Would it be possible to get your db schema or post it?